So, I guess I took the week off from blogging. I just didn't feel like it. I was busy with work, a special project Jennie and I are working on (more to come soon) and well, umm, life (husband, daughter, dog, house, etc.) .... But I thought it was time to catch up. 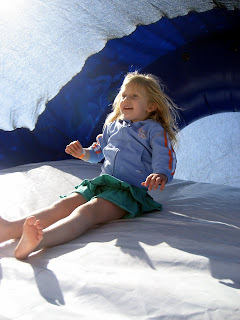 Saturday was the Tucson Moms' (the moms club I belong to and volunteer with) annual Fall Family Festival. Mike and I took Shelby to the event so she could enjoy all the fun things they had planned. 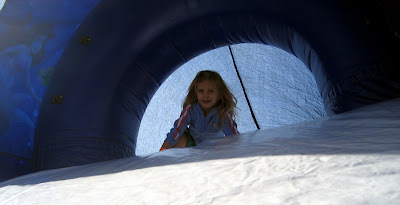 There was two different bounce houses, one with a slide ... of course Shelby wanted to stay in the bounce houses all day! There was a balloon artist, a mad scientist, games, treats (yes, Shelby had cotton candy, a snow cone and popcorn of the course of about 30 minutes! ), a wagon ride ... tons of fun for a four-year-old. It was also nice, 'cause Mike got to finally meet some of the girls I have gotten to be friends with trough Tucson Moms. I often mention them and he has no face to put with a name. Now he does. Saturday was also my birthday. The big 34. Mike and Shelby made me breakfast. I got to sleep in. Mike read a book to me (doesn't sound that exciting, but it was. I was having trouble getting through my book club book, so Mike read it to me. When almost finished it all that morning. He's going to read the rest to me tonight!!!) Then after the picnic and naps, we went to dinner at Cafe Poca Cosa, my favorite restaurant. Mike's parents met us there, along with his Great Aunt Dorothy. Mike had been prepping Shelby for a few days, so she knew she was going to a "fancy" restaurant. And it paid off. She was perfect. So well behaved. It was a great weekend and a great birthday. 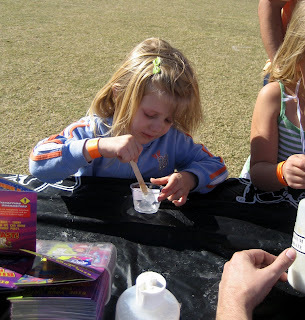 Shelby making slime with the Mad Scientist at the fall festival. The book I'm reading for book club is Michael Pollan's "In Defense of Food." Seriously, it makes me think about EVERY LITTLE THING I put in my mouth. After reading most of it, Mike and I will be changing our diets. More fruits and veggies and very little meat. And what meat we do eat, won't be red. We're joining a CSA here in Tucson, and we're going to start getting a box of fresh produce each week. I've even been thinking I'm going to start making our own bread from scratch. And then, I might try to talk my dad into adding some pigs to his farm, so we can have grass feed pork to eat. Shelby has been working hard at preschool. She can now spell her name on command and write it without a single prompt. She used to need us to write if for her first, but now she can do it all on her own. She signed the birthday card she gave me and was so proud of herself. It's amazing to watch her learn. She is just soaking up everything they are teaching her ... the other day she talked about directions and how we live in the southern part of town, school is north of our house and the sun sets in the west. She also told me that Papa lives VERY far north of our house. All of which are true. It's quite amazing if you ask me (but I am her mama, so I'm not too objective).